What more can a writer wish for! We have the severest of weather at the moment. I did get into the office one day this week. Just enough time to pick up all of my marking. I’ve actually worked at home ever since. The university has really advised this where possible. And because I’ve not had to travel and the email’s a bit quieter than usual I actually managed to finish the marking more quickly than normal. It’s not worth going out. It’s too cold and the road are treacherous. The pavements aren’t any better. Some people really do have to get to work: doctors and nurses, for example, and of course the retailers. So, I’m happy to leave the roads free for them. Mind you, clearing snow can be quite good exercise. Martin worked up a sweat yesterday digging out our cars. We needed to get mobile. We were running our of food supplies. He made a break for the shops yesterday afternoon as more snow was forecast for last night. That didn’t happen in the end. It was just extremely cold. The shops seem well equipped at the moment. They’ve told us not to panic buy. That might just make people panic buy. Apparently, they’ve had to throw away gallons of milk. We’ve managed to get enough milk. We have the normal supplies for a week, but could actually survive for two. The heating is still working. We have contact with the outside world through the normal media, which is still working fine. So, what else is there to do but write? I am getting so much done! I’m even managing to get more of my day job done because of lack of distraction and lack of travelling time. It makes you think, doesn’t it? I do have to admit, however, to a couple of distractions. We have a garden full of birds. At the moment they’re higher in the trees and in particular the tree right outside my window. The cat sits on the window sill and chunters. I have to stop and watch every now and then. 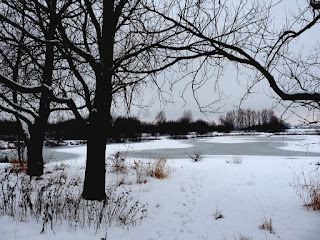 And then the snow, of course, is gloriously beautiful, especially the frozen lake opposite our house. I have to stop and look at that too. Reasons to Be Cheerful - about being a writer.